This carrier is brilliant. As soon as my 15 week old kitten climbed into it he started purring. It's so easy to cart around because you can carry it by hand or tuck the straps over your shoulder. My kitten seemed to feel perfectly safe and happy in it even on a loud rattling bus over bumpy roads. It is a great size for now, but I am not sure that a fully grown larger cat would be as comfortable in it, although it would probably still be fine for shorter trips as there is pretty of room for curling up, but maybe not so much for standing and stretching for a bigger cat. Excellent purchase if you have to travel by bus….the regular pet carriers are so bulky so this gets massive thumbs up from me! My kitten enjoys his outings in his furry cat carrier. He's always quiet in it (well, apart from announcing when he needs to use a litter tray – useful to know! The bag is washable; all you have to do is to just remove the wipe off panels first. It might not stand up to frequent washes though; I noticed some of the stitching started to come undone after the first wash.) I love the way he is cleverly hidden as a black kitten in a black bag. He can see out but no one knows I'm carrying a cat around with me, even dogs (and children) don't seem to be able to sense him nearby. It is fabulous. 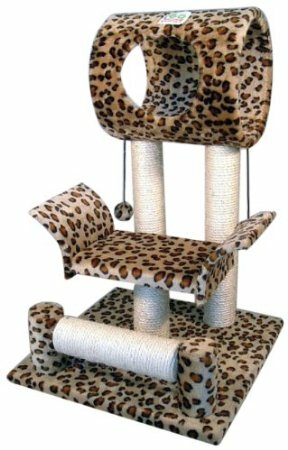 This cat condo is beautiful and very easy to put together. It was a very sturdy and durable product. My cats absolutely love it. They are sleeping on it right now while I am writing this review. The first one to get there claims the highest perch and the other one has to sleep on the lower ones. They play with the mice toys and have a ton of fun with them. They both love the little houses, too. Therefore, I will give this a five-star review. You won't find a tall monster gym like this for a better price. I've checked. I'll see how it does over the next year or so. If it holds up well, I'll get two more. It took only a couple of hours for all four of our cats to warm up to their new toy. At first they seemed unsure or, afraid of it. But once we sprinkled a bit of cat nip and placed a few of their other toys in various places on it; I think they realized then that the tree did in fact belong to them and now I can't keep them off of it! They love the two mice that are hanging from the tree and they've been batting it all day and night long. They also love to dive off of it too. I finally got my bed back. Now, they’re spoiled. What can I say? ?